The first match of the Star was at Newtongrange against Westfield Thistle and resulted in a 7 goal to 1 win for the Star. The Star played well as juveniles before finally succumbing to the better organised Newtongrange Athletic who were the first Junior team in Newtongrange. 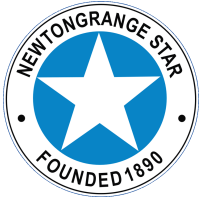 When the Newtongrange Athletic folded in 1896, two unsuccessful attempts were made to get the Star registered as a Junior Football Team before Mr Robert Duncan and Mr Thomas Pearson finalised the registration on February 1900. The first fully listed Newtongrange Star team for a game against Edinburgh Harp, the result was not printed. Star Team: Lockhart, Elliot, W. Deans, Briggs, Moffat, Kerr, D. Moffat, James Ross, J. Deans, Boyle, Reid (Date 17 August 1899). The Star had good seasons and bad, the period between 1905/08 were certainly good winning a total of 8 trophies plus 3 League Championships. The big hiccup in the Star´s fortunes occurred in Season 1913/14 when the Star had to apply for re-election, having played 14 games in the league - lost 13 and drew 1. The vote was very close, 4 members for the Star and 3 against. Another good period for the Star with sustained consistency and the Star winning 8 successive League Championships and 14 trophies including the Scottish Junior Cup, East of Scotland Cup twice, Musselburgh Cup twice, Marshall Cup twice, East Lothian Cup, Rosebery Charity Cup, Simpson Shield, Thornton Shield three times and Carmichael Cup. After the dizzy heights of winning the Scottish Junior Cup the inevitable fall from grace. In a manner that no one could have foresaw. Season 1933/34 saw the Star winning the League Championship in a playoff against Musselburgh Bruntonians by 2 goals to 0. The problem initiated with Portobello Thistle lodging a protest against one of the Star players, alleging an infringement. The East of Scotland JFA ruled against the Star and as a result the Star were ordered to return their League Flag and players badges. The Star appealed to the Scottish Junior FA and they overruled the EJFA decision - the Star were champions. Worse was to happen in 1934 when, after a special meeting in the Lothian Halls, the Star dropped a bombshell. 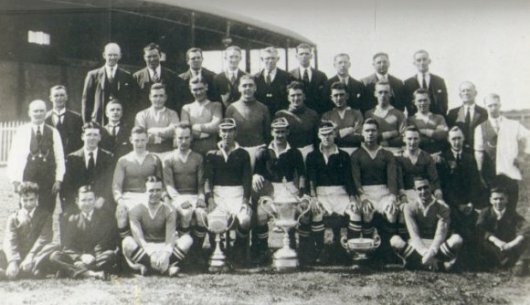 Due to lack of support and finance the Club were disbanding on 3 December 1934. The Star resumed competitively in August 1936 and up to the Second World War were happy just to survive. A determined effort by the Newtongrange Star Committee to achieve the high standards set by their counterparts in the 1920´s took nearly 5 years to bear fruit. The signs, even in Season 1946/47, were encouraging with the likes of William Bauld, and Fred Glidden in their line-up. 1950/51 and 1959/60. The seeds sown in the post war period bore fruit, and the Star went on to win 4 League Championships. East of Scotland Cup twice, Brown Cup twice, Thornton Shield three times, Murray Cup five times. In Season 1951/52 Newtongrange Star had the best team of all - Dagleish, Mann, Ferguson, Tighe, Skinner, Mackay, Halliday, Elms, Kinghorn, Slater and Hope. It would be wrong to name just one favourite player during that period but to name three Dave Mackay, Charlie Elms and Robbie Kinghorn. With the diminishing interest in Junior Football, Newtongrange Star like other Junior outfits, lived from week to week and May 1962 was almost the end of this famous club. It took the winning of 2 trophies at the latter end of that season to convince the Committee that it was worth carrying on. The seventies were again a period of good seasons and bad. 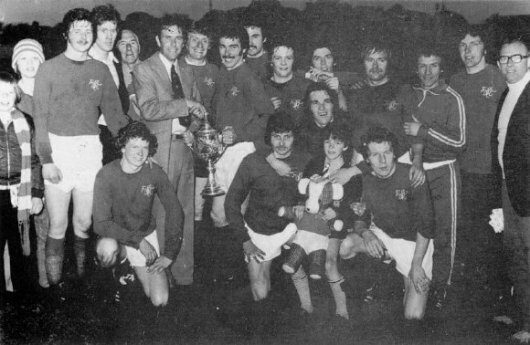 An example of the good was in Season 1970/71 when the Star reached the final of the Scottish Junior Cup losing narrowly to Cambuslang Rangers to 2 goals to 1. The Star team that day would probably be high in the Star supporters vote as the Team of the century. Star Team: Hogg, Knox, Printy, Sproull, Rennie, Gardner, Anderson, Hancock, Stoddart, Purcell, Hastie (Sub) Forrester. An example of the bad was in Season 1973/74 when they were relegated and yet, while in the B Division, they went on to win the National Dryborough Cup beating an over-confident Petershill by 3 goals to 0. To bring us through the 1970s and 1980s and still survive, the Committees of Newtongrange Star during those periods deserve a special thank you, for, with rising expenses they have performed miracles. 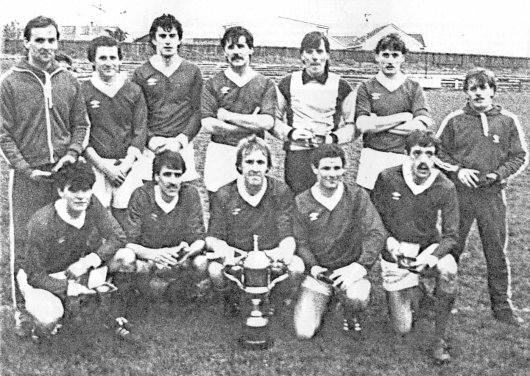 The 80´s started well winning the East of Scotland Cup, Robertson Homes Cup and the unique performance of winning the Thornton Sports Cup for the duration of its sponsorship over three years. After a few disappointing years a light could be seen on the horizon with the appointment of Mr Laurie Dunn as Manager. Laurie brought a new excitement to the club with some grand signings and this was reflected in attendances. He took the team to the semi-final of the Scottish Junior Cup only to lose out by the narrowest of margins. He finally got his just reward by winning the Radio Forth Cup. Due to family commitments Laurie had to reluctantly resign as Manager of the Star. This left the Committee with the problem of replacing such a good manager. As usual there was no shortage of applicants. After many nights of discussion it was decided that Mr John Buckley should be appointed the new manager of the Club. As in all management reshuffles there has to be heartache for some. John wanted to bring his own staff, appointing Mr Ronnie Tolmie as his assistant and Jim O´Malley as his physiotherapist, this led to Tom Cropley departing from the Club. Tom was and still is held in the highest esteem by Newtongrange Star for many years of devotion given to the Club as player and on Management Staff. John Buckley now in full control of the team set about the task of bringing silverware to the Club. After a quiet start he got things going his way winning the respect of players and supporters alike. Who would believe that in our pre-Centenary Year the Club would win four Cups, this holds good for the future of the Club. Newtongrange Star celebrated its centenary on 25 September 1990. The Star´s first years after the centenary celebrations were some of the most successful in the club´s history. 1991 saw the team bring home the East Region League Championship for the first time in 30 years. The Star also swept aside the likes of Kilwinning Rangers and Glenafon Athletic on the way to the final of the Scottish Junior Cup. Yet just as in 1971 there was disappointment as the team lost by a solitary goal to Auchinleck Talbot at Brockville Park in Falkirk. A year on and no less than five trophies were secured - another league championship and all the cups contested by the East Region. It was truly a wonderful time to be a Star player, committee member or supporter, and Gordon Fraser, John Coughlin and Paul Ramsay were all capped for the Scottish Junior side as a welcome bonus. Maintaining such heights would always be difficult. A year on and ´only´ two cups were retained. The league was lost in a championship decider against Fauldhouse United. Although galloping winger Bobby Forrest was capped by Junior Scotland. The following year the Star lost the league title to Camelon on goal difference. But there was at least one cup in the trophy cabinet by the end of the season. 1994 saw the club leave their home for the previous seventy years at Victoria Park and move to a new ground built on the site of the Redwood Bing. Yet the first season in a new home did not produce any significant moments. Manager John Buckley, who had brought so much success to the club, decided to step aside for family reasons but he will be remembered as our greatest ever manager. His assistant Ronnie Tolmie took the reigns, but his tenure lasted less than a year. 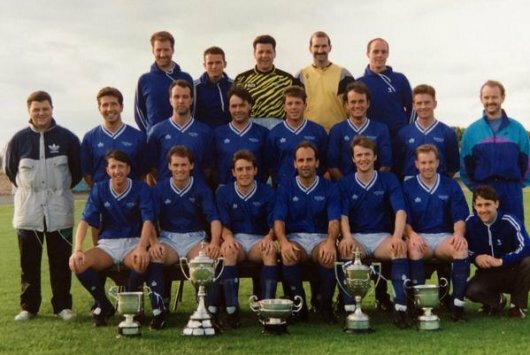 Another year of little note followed until in 1997 the Star, now under the management of Willie Garner, enjoyed silverware picking up the League Cup and the East of Scotland Cup. Those cup wins were to prove to be the last silverware for ten years though. In the first years of the new millennium, the Star lost the league title by a single point to Linlithgow Rose and enjoyed some notable ventures into the latter stages of the Scottish Junior Cup. They reached the quarter final in 2000 before going down to Benburb and a year later lost to Kilwinning Rangers in the fifth round. In 2002, a new league structure began with the best of the East Region combining with the Fife and Tayside Juniors to form a Superleague. The top five East Region sides would qualify. The Star had only finished outside the top five places once in ten years, but poor league form left the team second bottom and they missed out whilst Arniston Rangers and Bonnyrigg Rose took their places gladly. 2002 also marked the last time Gordon Fraser and Tony O´Hara would pull on a Star jersey as they both announced their retirement after an incredible 17 years with the club. In the next years that followed, the Star somewhat plodded along finishing mid table and without the enjoyment of any cup silverware. It was an unfamiliar state for a club so accustomed to success. Further league reconstruction in 2006 left the team languishing in the bottom league. Yet new manager Graeme Armstrong had assembled a side of youth and experience. Two promotions and a League Cup later the team were finishing fourth in the 2009/10 Superleague. There had also been some wonderful journeys in the Scottish Junior Cup with the team reaching the latter stages on a number of occasions. 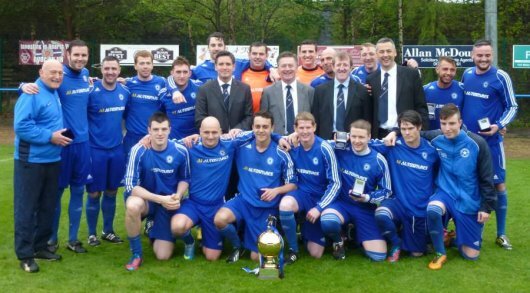 The best was a quarter final in 2009 before going down to Kirkintilloch Rob Roy. Furthermore, Damien Gielty became the Star´s first Junior international since 1993. A year later though came relegation. Graeme Armstrong resigned and his replacement was former Star player Alan Miller. He had a difficult job in building a team with only half a dozen players left from the Armstrong era, but within two years the team won the Premier League and gained promotion back to the Superleague. Paul Tansey and Sean Jamieson were capped by Junior Scotland the following season and a series of excellent results meant the team once again secured a fourth place Superleague finish. A league position they repeated in season 2014/15 as the club continued to flourish after 125 years. 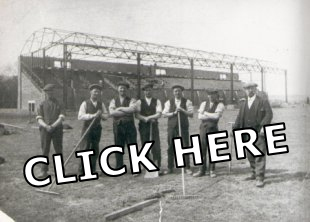 If you would like to discover more about the history of Newtongrange Star FC then click the picture above.